Valor, Mr. President? Where is yours? Last week, Trump appeared at the CIA, before its wall of heroes, blustering again about grabbing Iraq’s oil and boasting of the number of times he’d appeared on Time magazine (more than Patriots quarterback Tom Brady, which seemed to please him to no end). Perhaps Trump will next appear before Christ on the cross to complain about how he (Trump) is being crucified in the press. You’ve got to hand it to Trump: the man simply has no shame. And no taste either. In memory of the Challenger crew, lost 31 years ago today. A good way to honor them is to learn from the mistakes made in the decision to launch that cold morning. When the Challenger blew up thirty years ago this January, I was a young Air Force lieutenant working an exercise in Cheyenne Mountain Command Center near Colorado Springs, Colorado. I remember the call coming in to the colonel behind me. I heard him say something like, “Is this real world?” In other words, is this really happening, or is it part of the exercise? The answer at the other end was grim, our exercise was promptly cancelled, and we turned on the TV and watched the explosion. Yesterday, I caught President Trump’s speech before the CIA. As he stood before the wall of honor, surrounded by the stars on that wall that represent those who gave their lives for their country, Trump deviated from his prepared comments to boast about how many times he’d appeared on the cover of Time magazine. Here’s what he said: I HAVE BEEN ON THEIR COVER ABOUT 14 OR 15 TIMES. I THINK WE HAVE THE ALL-TIME RECORD IN THE HISTORY OF TIME MAGAZINE — IF TOM BRADY IS ON THE COVER, IT’S ONE TIME. I’VE BEEN ON 15 TIMES. I THINK THAT’S A RECORD THAT COULD NEVER BE BROKEN. Really, President Trump? You’re giving a speech before members of the CIA, and what comes to mind is the number of times your own mug has appeared on a magazine cover? And you’re doing this in front of the CIA’s wall of honor, which, according to your own words, is “very special”? Whatever one thinks of the CIA and its history, one thing is certain from this speech: America has elected an appallingly tone-deaf and callous narcissist as its 45th president. Note to reader: In May of 2008, I wrote this draft article, which became the basis of a shorter piece published at Nieman Watchdog later that year under the title, “Networks should replace Pentagon cheerleaders with independent military analysts.” Media coverage of the U.S. military and America’s wars is often lamentable as well as one-sided; if anything, media coverage as well as access under Obama has worsened. I’ve decided not to edit what I wrote in 2008, partly because the underlying dynamic remains the same. Rare it is for the curtain to be lifted on the messy realities of war; and those who choose to lift it, like Chelsea Manning, pay a high price indeed for honesty. The first thing that came to mind as I read David Barstow’s exposé [April 2008] in the New York Times, “Behind TV Analysts, Pentagon’s Hidden Hand,” was the classic scene in Casablanca where Claude Rains expresses his shock to Humphrey Bogart at the gambling going on, even as he collects his own winnings. Surely, Americans knew that the retired generals and colonels being paraded before them on network news were, in spite of their mufti, anything but unbiased, independent, “civilian” critics? Not surprisingly, the mainstream media has either ignored Barstow’s exposé or effectively dismissed it as old news or business as usual. Fortunately, Glenn Greenwald at Salon has tenaciously pursued the story, revealing ever more clearly how the Pentagon’s propaganda campaign tried “to put the best possible face” (one retired officer’s words) on failing efforts in Iraq. Clearly, the Pentagon courted these retired military men, identifying reliable “go to guys” and rewarding them with access to the Pentagon and the Secretary of Defense (access being pure gold within the Washington beltway). Such access included the aforementioned, invitation-only, PowerPoint briefings, which included “talking points” that these officers could then robotically repeat on TV, passing them off as their own informed and unbiased opinions. Such collusion indicates a well-oiled, influence-peddling, Pentagonal machine serviced by sycophantic cheerleaders, and it assuredly warrants investigation by Congress. That said, the very idea of relying on retired military men as expert critics was fundamentally flawed from the beginning. The obvious reason why networks relied on these men (and they were all men) as expert commentators was because they lacked their own in-house experts. That, and the fact that they wanted to purchase the authority of these colonels and generals while being seen by viewers at home as patriotic and supportive of the troops. Despite their civilian coat-and-tie camouflage, these officers are not ex-generals and ex-colonels: they are retired colonels and generals–a distinction with a difference. They still carry their rank; they still wear the uniform at military functions; the rank-and-file still deferentially call them “sir”; their cars still have military stickers with eagles (for full colonels) and stars (for generals); they’re still saluted smartly when they drive on- and off-post. These men enjoy constant reminders and privileges of their high military status, and I’d wager nearly all of them think of themselves as military men first, “civilians” second. In short, these men identify with the U.S. military–indeed, they are the military–hardly a recipe for disinterested or dispassionate analysis of our military’s performance in Iraq, or anywhere else for that matter. Along with identifying closely with the military, many of these media generals and colonels serve as advisors to defense contractors, who potentially stand to profit from continued fighting. This remarkable state of affairs persists despite the fact that, throughout their career, military officers are taught to avoid even the appearance of conflicts of interest, precisely because the potential for impropriety taints the integrity of the officer as well as the entire military-contractor process. It’s not enough to say, “I’m a man of integrity and I’d never compromise it for self-interest or personal gain.” You must strive to avoid even the appearance of a conflict of interest–a maxim that is so drilled into military training that it should be reflexive to these men, like coming to attention and saluting the flag as the National Anthem is played. Yet several of these men apparently saw no conflict in advising defense contractors while marching before the TV cameras to present “critical” and “independent” military analysis. Within the military, there’s a strong bias against Monday-morning quarterbacks. There’s a natural tendency to defer to the commander-in-the-field, and to allow him or her to get on with the job without being micro-managed or second-guessed. As newly minted “civilian” advisors to the networks, these men don’t want to become what they themselves probably despised while they still wore the uniform–those cold, timid, milquetoast critics who’ll never know the triumphs and tribulations of Teddy Roosevelt’s mythical man in the arena. Along with a strong bias against second-guessing, many military men see criticism as disloyal and destructive, not loyal and constructive. As a concept, loyalty within the military is simple to define but incredibly complex in its manifestations. Officers swear an oath to the Constitution of the United States, of course, and to that they must remain loyal. But there also exist strong personal and institutional loyalties; sometimes, these loyalties are so strong that they come to obscure the somewhat more abstract, if higher, loyalty to the Constitution. Sadly, some military men put loyalty to their service branch first, even before loyalty to the Constitution. Or they conflate the two: What’s good for the Army is ipso facto good for the country. This is not to say these military men are somehow “bad”–only that they’re human. To understand this better, let’s look at a typical general’s background. In a very powerful way, this man probably lives for and loves the military. Military service may be in his family tree for generations. Perhaps he followed his father from post to post as a child (a military “brat,” it’s called, with affection). He then attends a service academy like Annapolis or West Point, where he’s told incessantly that he’s the best, and where he also learns that loyalty to one’s peers and service is paramount. As a commissioned officer, he then serves for thirty or more years in uniform, achieving flag rank and all the privileges as well as burdens that come with that rank. After this man retires, would we expect him to become a dynamic and even outspoken critic of an institution that defined his life? An institution that he loves? It’s unlikely that senior military men will provide trenchant criticism, not only because they identify closely and personally with the military, but because they don’t want to run the risk of possibly undermining troop morale in the field. Related to this is the belief that “negative” and “biased” media criticism led to America’s defeat in Vietnam, the old “stab-in-the-back” myth that I’ve addressed elsewhere, and that Barstow’s exposé proves is still alive and well in today’s military. In defending the evenhandedness of most media coverage, Danelo’s piece drew two strong dissents in the February issue of Proceedings. One Navy officer wrote to complain that Danelo failed “to level criticism at reporters for not doing their part to ensure victory.” Today’s press, this officer implied, neither supported the American soldier nor wanted to see America succeed in the war. Another officer, a retired Marine, wrote that “just one negative story” from an American journalist “bolsters our enemies’ confidence and resolve while equally destroying support from the public at home, thus eroding our servicemen’s and women’s resolve on the battlefield.” Refusing to suffer such journalistic “fools,” whose “stories could not have been more harmful than if al Qaeda had written them,” this officer demanded immediate military censorship of media working in-theater. Those journalists who refused to cooperate “would operate at their own risk and without military protection,” he concluded ominously. Such opinions remain a commonplace in today’s military, especially among men of a certain age who began their service at the tail end or soon after the end of the Vietnam War. Indeed, evidence strongly suggests Senator John McCain shares this opinion. Paradoxically, the fact that the war in Iraq has not gone well may be a reason why some of these military men believe we can’t afford criticism, especially if you believe this war can and must be won, as most of them do. Call this the “You can’t handle the truth” argument, combined with the “wars are always messy” argument. These arguments lead military men to suppress their own doubts, fearing that, if they air them fully, they’ll not only fatally wound an already faltering war effort, but that their peers may even see them as having given aid and comfort to the enemy. The last, and perhaps most powerful, reason why networks should not lean heavily on retired military men as commentators is that it’s extremely difficult for anyone, let alone a diehard military man, to criticize our military because such criticism is taken so personally by so many Americans. When you criticize the military, people don’t necessarily recognize the patriotic subtlety of your exposé of the military-industrial complex. They hear you attacking Johnny and Suzy—the efforts of their son and daughter, or the boy and girl next door, who selflessly joined the military to defend America and make a positive difference in the world. Who really wants to hear that Johnny and Suzy may possibly be fighting (and dying) for a mistake? (Another way of putting this might be, “Why doesn’t that Cindy Sheehan shut up already?”) And, assuming he believed it, what retired military man wants to pass along that message to an audience of millions on TV? Relying on senior military officers, recently retired, to serve as disinterested critics is a bit like inviting Paul von Hindenburg, ex-Field Marshal of the German Army, to testify in 1919 on why his army lost World War I. You may get some interesting testimony–just don’t expect it to be critical or for that matter even true. What the mainstream media must do now is act. Specifically, they must develop their own, independent, military experts, ones not beholden to the military-industrial complex, ones who don’t own stock in the defense industry, ones who don’t serve as advisors to defense contractors. The mainstream media must also be willing to risk the ire of the American people by criticizing the military in stronger terms. The fact that major media outlets have come to rely on military talking heads for “critical” analysis reveals the inherent timidity of today’s media in taking on the Pentagon and the Bush Administration. Media outlets must get over their fear of being perceived as unpatriotic. They must air tough-minded criticism, even if some viewers tune out, turn off, and drop in to “patriotic” outlets like Fox News. Obviously, it will take time for the media to develop its own, truly independent, military experts. In the meantime, they should consider using junior officers and NCOs, with recent combat experience, who have separated from the service. Why does an “expert” have to be a retired, white-haired colonel or general? For that matter, why does an “expert” need to have worn an American military uniform? Some of the most creative analysis may come from “civilian” military historians or even from foreign military officers who are not emotionally connected to the U.S. military, and who thus don’t have to worry about having their patriotism questioned each time they hazard a criticism of U.S. strategy or tactics. Until the mainstream media takes these steps, it will continue to be in thrall to the military, as is Congress itself, which also largely refuses to challenge the military before or during a war, in part because members of Congress fear being accused of defeatism and thus of losing elections. The truth is that there’s a creeping militarism in our country–an excessive deference to military men, whether retired or still on active duty. Just look at the acclaim awarded to General Petraeus each time he comes to testify before Congress. Indeed, the presumptive Republican presidential nominee, John McCain, is already deferring to Petraeus, stating he would not make any decision regarding diverting troops to Afghanistan to search for Osama bin Laden without first receiving the blessing of the presumptive commanding general of CENTCOM. If that’s where we’re headed, why don’t we just declare Petraeus to be our Caesar and appoint our “civilian” mainstream media military experts to command his Praetorian Guard? It sure would make matters clearer to the American people. 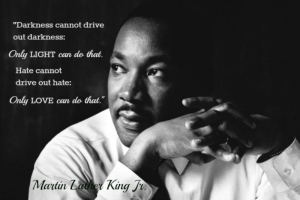 In honor of Martin Luther King Day, a reminder of what he stood for: equality for all, and violence toward none. When not fighting racism, he fought against unjust wars, including America’s war against Vietnam in the 1960s. This made him unpopular, which didn’t bother MLK in the least. A man of great moral courage, he deserves to be celebrated in all his complexity and strength. On April 4, 1967, Martin Luther King Jr. gave a powerful speech (“Beyond Vietnam – A Time to Break Silence”) that condemned America’s war in Vietnam. Exactly one year later, he was assassinated in Memphis. There is nothing except a tragic death wish to prevent us from reordering our priorities so that the pursuit of peace will take precedence over the pursuit of war.